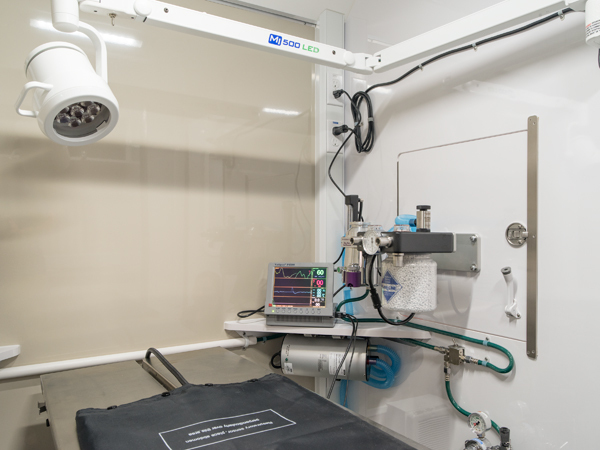 The Blue Door Veterinary Services mobile unit has a fully-equipped surgical suite with complete capabilities to perform a wide range of surgeries available at a traditional veterinary practice. We perform pre-anesthetic blood work prior to every surgery to ensure that your pet’s anesthesia is as safe for them as possible, as well as complete anesthetic monitoring during your pet’s procedure to ensure their safety throughout their care. We know that surgery can be a stressful time for both you and your pet, so we have provided a number of answers to questions we’re commonly asked. Please click on your question to reveal the answer. If you don’t see the answer you’re looking for, please contact us and we’ll be happy to assist you. Does my pet need to fast before their surgery? Why does my pet need pre-surgical blood work? What kinds of surgical monitoring will you use during the surgery? Where will my pet recover from their surgery? Unless otherwise directed by Dr. Dawson, no food should be given to your pet after 10pm the night before surgery. They may have water available to them overnight. Pre-surgical blood work is administered so that we can ensure that your pet is healthy enough for surgery. Understanding their health conditions will enable us to customize the medications we use for anesthesia for their safety and well-being. During your pet’s surgery, they will be fully monitored to ensure that their heartrate, blood pressure, respiration, body temperature, and more are maintained. The surgical monitoring tools that we use are the same as those used by traditional veterinary practices and similar to that used in human medicine. Your pet will wake up in our mobile unit, and when we have been assured that their recovery is progressing normally, they will be allowed to recover fully in the comfort of their own home.